Wingnut for Pedestal Mount. With distance plate for mount on e.g. Suction Cup Mount with AMPS-holes. Please read all of the instructions and look at the pictures before installing the wingnuts. 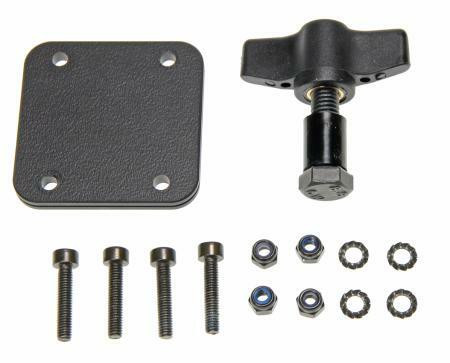 This accessory consists of: distance plate, four screws with nuts and washers, bolt, distance tube made of plastic, and wing nut. 1. Place the distanceplate onto desired position. Place the bottom part of the Pedestal Mount onto the distance plate. Fasten using the enclosed screws, nuts and washers. 2. Insert the bolt into the hole of of the Pedestal Mount. Thread the next part of the Pedestal Mount onto the bolt. 3. Thread the distance tube onto the bolt. Lock the position of the Pedestal Mount using the wingnut. 4. Example mounting solution showing.